By the time you hit the renowned "mid-life crisis" when you are, theoretically, equipped to make better choices. In reality, your 20s and 30s wide-eyed optimism has usually been replaced by a more cynical outlook on jobs and the workplace. In this episode, I'm going to take a look at some of the many "buts" that prevent people from career planning for themselves and then I shall propose an alternative to career planning that will help you get started pursuing what you really want to do. Fair warning: there's a lot of "buts" in here. I wasn't surprised that no hands went up at this workshop. A couple of Gen Xers and the rest millennials, not a single one had a career plan. In most workshops, I'll see maybe two hands tentatively raised when I ask who has a personal career plan. It's hardly surprising that Gallup's State of the Global Workplace Report in 2017 finds that 85% of employees are disengaged. Why would you be engaged in your work if you felt as if you were going nowhere you really wanted to go? So they shared their "buts" with me as to why they didn't have a career plan. Maybe you have these "buts" too. But there's no point in planning when the world is changing so quickly! 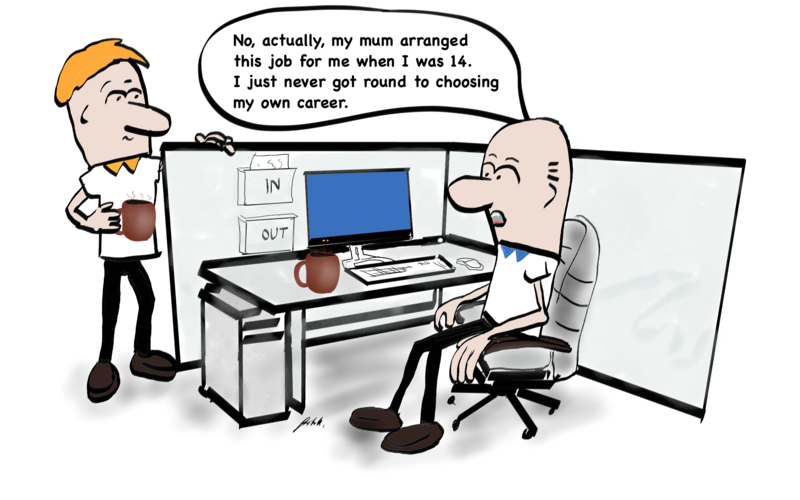 Of course, there are problems in career planning. It's difficult enough to think about 20 or 30 years ahead. Interestingly, I find that the older you are, the easier it is, but that is not so critical. The problem is that we struggle to plan into a future that we anticipate is going to be very, utterly, completely different from today. That the world will be different in 10 years time is not an excuse not to plan, rather, it's a reality to consider and allow yourself to change your plans and remain agile with the ever-changing world outside. But isn't it HRs job to plan my career? But it's so difficult to know what I will want to be doing in the future. In ‘the road less travelled’, M. Scott Peck starts: “Life is difficult”. What is most surprising, is that, for many people, this is a revelation! Go to any business networking event, or meet a potential client or recruiter – especially during the current economic situation and they will be moaning incessantly about the enormity of their problems, burdens or difficulties as if life should be easy. In my early twenties, I was already happily shifting my thoughts to management and a (slightly) easier life. By my late 20's I was writing computer code and planning on that as my new career path. I could go on. Sure, plan for 20 years ahead or more, but changes are allowed, it is your career, your life, your future. But, I'd rather leave my career to chance. Actually, no-one ever says that. Well, they don't use those words, but without any sort of plan on your part, that is exactly what you are doing. You are at the effect of the external environment (the world, other people) and something the world calls "luck". If your "luck" is good we'll put that down to good karma or synchronicity and enjoy the benefits, if bad we're more likely to blame others and be miserable. If you happen to have happened upon the perfect career, thoroughly enjoy it, find meaning in it and this is going to continue until you choose to retire then you will be highly engaged, love what you do and probably won't be planning to change anything. You can probably stop reading now. What I have discovered over the decades I have lived is that the more I plan and work toward achieving the plans goals, the "luckier" I get. But what if success doesn't happen? Particularly for those just embarking on their journey, ‘success’ in a career is a place far, far away. We may have wonderful dreams about it and a delightfully crafted goal. But as the days, weeks and months go by and ‘success’ doesn't appear to be any closer, many people throw in the towel and give up because ‘success’ is impossible, we’ll then criticise it. Anyone who achieves success whom we deem less worthy is the subject of our scorn and contempt – “they don’t deserve it!” or "they were lucky!" But why do I have to plan anyway? Can't I just see what happens and then simply change jobs? Everyone has a story about someone they know who got their "big break". But how do I get ready for when an opportunity comes my way if I don't know when it's coming or what it is? We've all had bad bosses, perhaps they micromanage you, or think punishment is motivating, or can't communicate clearly, and they never seem to have time for you. Well, they took an opportunity that presented itself and they weren't ready. It's not difficult to learn how to lead and delegate effectively, it's not beyond you to understand what motivates people. It's easy enough to find training on communication and practice it. And there's more on time management and prioritisation than all of them. Yet somehow, that boss neglected to put any effort into developing the knowledge and skills. Yes, they were "lucky" enough to be chosen, maybe conniving, maybe astute, maybe simply related to the right person. But they weren't ready. If it's a previous boss, you probably left that job because they weren't ready. If it's your current boss, you're likely thinking of quitting because they weren't ready. If you're not ready, you'll be a bad boss too. But what if my lucky break is for something that I'm not prepared for anyway, since I can't foresee the future? What's really interesting I find, is that viewed in 20:20 hindsight, that seemingly sharp turn off course you took makes absolute sense and you can see why it worked and why you were ready for it, even though it wasn't part of your original plan. If you had tasted my mum's grey, mushy Brussels Sprouts, burned Topside and lumpy gravy, you might not think yourself to be fortunate, but my "lucky break" was that my mum hated to cook and was especially bad at it causing me to save my taste buds and get in the kitchen to learn. So how do I plan if I don't plan then? I'm so glad that you asked. We're not planning exactly, but we are creating a roadmap for gaining control over your career. Sidebar: You would be surprised by how many self-employed people and entrepreneurs are not doing something that aligns with their own mission, culture and values. Often because they haven't found a way to make money and hence compromise one or even, all three in the pursuit of filthy mammon! And before you start on me and say "but, changing the world" is a little ambitious, John. Yes, the problems that you care about are huge and complex and maybe you can't see yourself making a significant difference. Remember what matters is not necessarily the size of your impact, rather it's that you are making a positive contribution at all. Once you have a good, or some, idea about the impact you want to make in the world, you're going to consider your own contribution. Then your long-term needs and then a vision for yourself. Rather than make this an extra long episode that overwhelms you, here's what I suggest: Take that first action step to brainstorm what impact you want to make in this world, answering those three questions above as well as you can. Then write to me by email and ask me for the rest of the guide. Simply ask and I will reply with a PDF that you can use to guide you through this process of establishing a roadmap for gaining control over your career. When you've finished you'll have a clear idea of what you will be doing to contribute to making an impact in this world that is meaningful for you and how you are going to get there. It becomes your Command Intent. I'll share more in the guide. When someone is looking to fill a vacancy for any position higher than cannon fodder, they do not start by asking: "Who has the ideal skill set, attitude, character. aligned values, history and qualifications for this position?" No, they ask: "Who do we know who... ?" It's not your qualifications or your experience that will get you that position, it's whether you are known to the people who get asked that question.